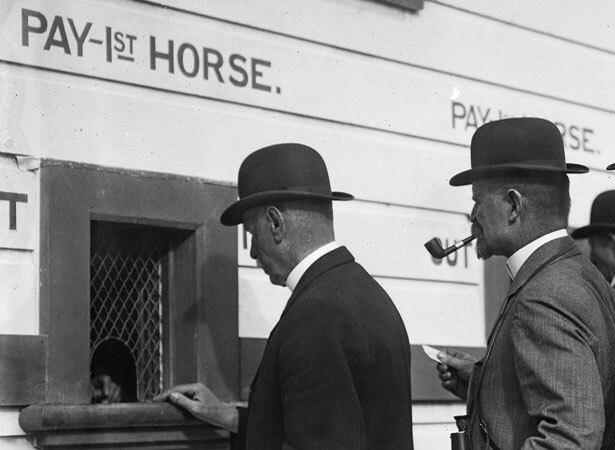 A 1910 amendment to the Gaming Act banned bookmakers from New Zealand racecourses, other public places and hotels. The bookies were farewelled after the last race at Takapuna, with a band playing appropriate tunes such as ‘We Parted on the Shore’. Bookies were private entrepreneurs who displayed the odds they were offering to the punters they hoped to outsmart. They came under increasing pressure from the late 19th century as mechanical totalisators began operating on New Zealand racecourses. Totalisators computed the amounts bet on the horses in a race, deducted a fixed proportion, and distributed the balance among those who had selected the winners and placegetters. As betting continued, likely dividends were displayed in close to real time. In reality, bookmakers did not disappear and many illegal operators continued to make a good living. Totalisator bets could not be placed by telephone or telegraph, technologies bookies embraced. In the 1940s it was estimated that the annual turnover from illegal bookmaking exceeded £24 million (equivalent to $1.8 billion in 2010, when actual TAB turnover was $1.6 billion). We have 1 article, related to Bookies take last bets on New Zealand racecourses.